Paul Graham is an American programmer, investor and writer. In 2006 he wrote an article entitled “How to be Silicon Valley” (http://www.paulgraham.com/siliconvalley.html). In his article he suggests that “What it takes is the right people”. He says that to establish a “Silicon Valley” you need two types of people in sufficient numbers – “nerds and rich people”. The “nerds” bring the creative energy, the ideas and the technical expertise upon which startups are created. The “rich people” are investors willing to provide the funding. He goes on to describe how Silicon Valley in Northern California emerged as a hub for startup activity in the late 1970’s. The “nerds” came from some of the world’s top universities – Stanford, Berkley and others – in the Silicon Valley area. Many of the “rich people” were folk who had made their fortunes by setting up startups of their own in Silicon Valley. a ready supply of wealthy people willing to invest in risky startups. With these thoughts in mind, where in South Africa could we hope to see our own Silicon Valley emerge? I guess that the knee-jerk answer is Cape Town. After all it has good universities and a beautiful natural environment dominated by the sea, the mountain and delicious Cape wine …. I have my doubts, however. Without wishing to detract from the obvious advantages of Cape Town as South Africa’s ICT hub, I want to draw your attention to another part of our country – namely Braamfontein in central Johannesburg. I think that it has many advantages over Cape Town and anywhere else in South Africa. What has Braamfontein got going for it? Firstly it is already an important hub at the centre of Africa’s richest region. Gauteng accounts for 40% of South Africa’s GDP. Most of this wealth is concentrated in a 10km circle stretching from the Joburg CBD to Sandton. 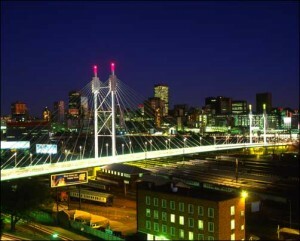 Braamfontein is near the centre of this circle. Braamfontein, and its immediate surroundings, is an educational, government and business hub. It is the home of two major universities (Wits and UJ), three of the four big banks (FNB, Standard and ABSA), the administrative centres of both the City of Johannesburg and Gauteng Province and major corporations such as Liberty Life, SAB Miller, Anglo American, Transnet and others. It is also a transport hub with South Africa’s largest mini-bus taxi rank, railway stations (Metrorail, Gautrain and national), bus routes and motorways (M1 and M2). The beginning of a software innovation hub is also taking shape in Braamfontein. Wits University’s Joburg Centre for Software Engineering (JCSE) and Digital Arts Centre are on the Wits East Campus. Thoughtworks, the innovative American software company, has set up shop in Braamfontein. There are also plans for IBM to establish its South African “Skills Development and Research Institute” at Wits. Given all of this I believe that its time to take Braamfontein more seriously. It is a strong candidate to become Africa’s Silicon Valley. I believe in it – watch this space!! There’s more to the story of the Silicon Valley , simply having a handful of wannabe nerds and or with nothing that drives them will not be enough. In the 1970’s hacker culture was born and we saw the manias and foibles of those men with deadpan hilarity and cogently that have shaped the computer business we see today. And I think that was a uniquely American saga of creativity and ego that was once uproarious. The boys of the Silicon Valley have made their millions, I doubt if the can be a repeat of that. Japan, Korea and China have tried to have their own Silicon Valley but it has not been without difficulties. Whilst I appreciate that the blog entry about Braamfontein as a potential “Silicon Valley” falls broadly into the scope of the aim of the blog, I nevertheless found this story on Braamfontein too speculative. The previous comment, by Samkelo Tyatyantsi, has a valid point in it. For me it would be more interesting if the blog would discuss matters with a stronger focus on concrete technical details, problems and solutions, numbers and figures.